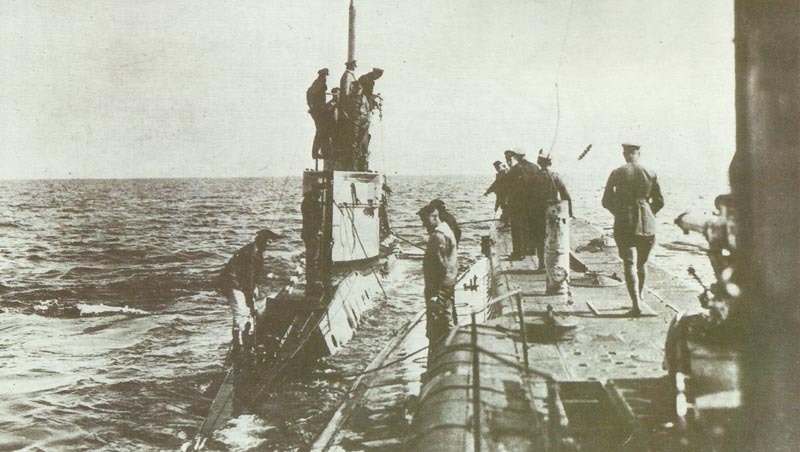 U35 receives visitors from a small UB coastal sub. The figure in British uniform on U35 (right) is Captain Wilson, King’s Messenger, taken prisoner by Arnauld during this patrol. Mediterranean: U35 (Arnauld) returns to Cattaro after record-breaking 25-day cruise (since July 26) sinkings with 900 shells and 4 torpedoes: 54 ships (32 Italian carrying 50,000t coal), totalling 91.0001 mainly in Western Mediterranean (French patrol areas). Secret War: Austrians crack new Italian cipher system in 38 hours. Salonika: Sarrail and his five Allied commanders agree to postpone offensive but launch counter­-offensive as Bulgar 7th Division causes 380 casualties to retreating French. Serbian General Jurisic-Stuerm replaced in command of Third Army by General Vassic. Armenia: IV Caucasus Corps retakes Mus bridge and 500 PoWs. Persia: Baratov halts on Sultanbulak Pass 50 miles north of Hamadan, has 7,000 fit troops and 22 guns against 17,000 exhausted Turks. Austro-Montenegrin peace talks broken off.